Take Away the A shows how removing one letter from a word can change it completely. Just imagine what life would be like without different letters in the alphabet. With this in mind, Michaël Escoffier and Kris Di Giacomo have designed an alphabet book with a difference. Each double-page spread highlights one letter by using a word that features it, and a new word which is created when that letter is removed. 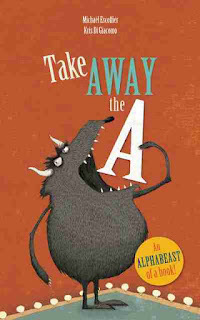 “Without the A the BEAST is the BEST” depicts a rotund hairy beast standing in the winner’s position on a podium, visually demonstrating the two words. Other examples I particularly enjoyed were: “Without the N the MOON says MOO” where a cow dressed in a superhero cape and mask is leaping over the moon, accompanied by a cat playing a fiddle, and “Without the I STAIRS lead to the STARS” showing a staircase spiraling up through the clouds and into a starry night. But it’s difficult to choose favourites - they’re all fantastic, and the explanation behind “Without the Z” is a nice nod to the alphabet song so many children are taught. Take Away the A is a clever and fun book with quirky illustrations in muted colours. But more than that, it’s a book to explore language and word games, and turns vocabulary and spelling into a creative activity.